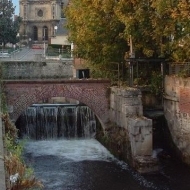 Naturally before starting this walk in Gisors you will have taken note of the extraordinary heritage that constitue the medieval fortress and the « Cathedral » church of Gisors. If this were not the case, discover them quickly by clicking on their respective links. Indeed, the idea of this walk is to discover the heritage spread throughout the city, less known, but equally prestigious! Probably built in the second half of the 15th century, the Wash House is fed by the River Epte. This emblematic 117 km river marks the historical and geographical border of Normandy. 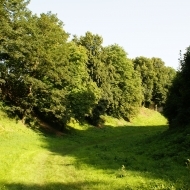 Today, the Epte valley is a natural site classified. From the Wash House, you will travel along the remains of the 12th century wall, built to protect the city. From the moat, you will appreciate the extensive view of the castle walls and on the many towers which mark it out : The Prisoners Tower, the Blue Door, the Trembling Tower, the Unnamed Tower, the Devils Tower, the Field Door, the Square Tower and two pentagonal towers. It bears the name of the city of Vienne in Isère to honour the support given by this town during the Second World War. The top of the street retains, despite the bombings of 1940, many half-timbered houses dating from the 15th and 16th centuries. Discover more particularly the “Passage of the Monarch” referring to Philippe-Augustus. During the 12th century this “Passage” was the main entrance of the Castle. At No. 8 was located the old court of the bailiwick and the prison of justice. At No.6 was formerly stood the home of sir Grainville, where Henry IV stayed several times. 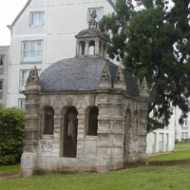 Last vestige of the Garden Pavilion of Douet de Graville dates from the end of the 16th century. 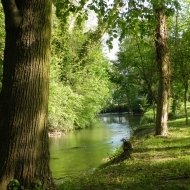 Located within a French garden, and surrounded by three hectares of parkland. The Garden Pavilion or Gloriette contains decorative components of the park. The wrought iron grids were welded by the pupils from Gisors secondary school in 1980 based on a drawing by Gendreau, architect of the French Building Institute, and following a 17th century model. 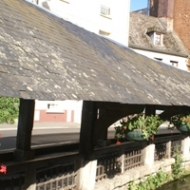 Water, the frontier symbol through the river, was also the symbol of the economic activity of Gisors until the Second World War. Initially in the Middle Ages it was with the tanners and shoe-makers, then in the 17th and 18th centuries it was under the influence of Colbert with cloth manufacture, lace and tapestries. Finally in the 19th and 20th centuries it was with the spinning and weaving industries, and cotton washing and dyeing. This statue is the work of Michel Poix. This stainless steel, contemporary work is very unusual. It tells a story, as well as talking about truth and honesty. The story : On September 28th, 1198, Philippe-Augustus broke through the barricades established by Richard Lionheart, and entered the city. In his passage, a bridge gave in and he fell into the water, the weight of his armour carrying him to the bottom. On the way seeing a statue of the Virgin, the sovereign promised to gild it if he succeeded to be saving. That is why Virgin took the name of Golden Virgin. 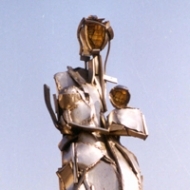 The artist’s message : the body of the sculpture is not uniform but “torn” in the top of the bust. It is on one hand about the symbolic expression of the opposing forces that divide all men, or more precisely, about a mother torn by the death of her son. On the other hand, it is also a symbolic expression of the necessity of breathing and of opening fully to the world. As you can see, the head of the child coincides with the left breast, the last point of carnal union between a mother and her child, who does not belong to her any more. Finally, Michel Poix had chosen to gild the inside more than the outside to interiorize this wealth. Much more than an over demonstration, it is the internal spiritual brilliance that is important. 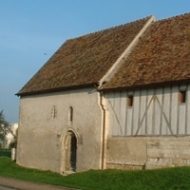 The vaults are the last remains of the Leper-house founded in 1210 by Jean de Gisors. This vault dedicated to Saint-Lazare was classified a Historic in 1992. In 1996 an important work of consolidation and restoration was completed. Decorated with mural frescos painted by Dado, the vault is only opened on the days of the inheritance. 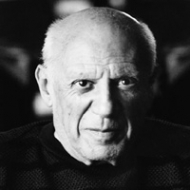 From 1930 to 1936, Boisgeloup, a small gisorsien hamlet, was home to the Emperor of modern Art : Pablo Picasso. In Boisgeloup he created many sculptures. His workshop then was full of fantastic animals and big heads. We find the influence of Boisgeloup in his works “Boisgeloup Under the Rain” (March 1932) a small oval painting representing the place which bears today the name of the painter, “Naked Woman in a red Armchair” (July 1932), “Minotaur and the Girl” (June 1933) and “The Murder” (July 1934). Lastly, it was Boisgeloup that was the background for the masterpiece of the century, “Guernica”. 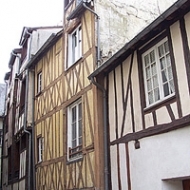 The history of this property is placed in the different step of Gisors development. Just like the family which it shelters, it plays a major urban role. This is in 1610 that the Duchess of Orleans-Longeville start to built the house of Recollects (men’s monastery) in Gisors. The establishment is then located rue des Fontaines. In 1788, is held an assembly of Deputies of the Department of Gisors, chaired by Pontecoulant, Marshal of the armies of King Louis XVI. It is then reshuffled under Louis XVI by Louis-François Passy (1760-1834), the Receiver General of Finance. Louis-françois Passy’s friends have bought for him this property to give it a citizenship certificate. The convent of Recollets thus becomes during 190 years the Passy family property. This family gave in the 19th century, eminent servants of the state and in particular the first Nobel peace prize in 1901. The property was then belonged to Madame Marie Françoise Louise Adelaïde Passy, Countess De Beuil, having been received in the estate of M. Louis Paulin Passy her father and then to the consortium De Beuil her descendants. Today, the park project helps restore its letter of nobility to Gisors’s sector. In a step of enhancement of quality of life and sustainable development of the commune, the plot has been acquired by the municipality in 1997. The draft Environmental Park is in the process of preserving the environment, blue for the river, green for the nature. But also to provide the town center of a real green lug, with the aim in the long term to establish continuity through an already existing network of paths, which need to be marked out, equipped and landscaped. The environmental park is open from 8:30 am to 4 pm from November 1st to January 31st until 6 pm from February 1st to March 31st and until 7:30 pm from April 1st to October 31st.